Volusion review: plans, themes etc. (2018) – Volusion or Shopify? » Volusion review: plans, themes etc. (2018) – Volusion or Shopify? Having been established already in 1999 Volusion rivals the likes of 3Dcart as one of the oldest e-commerce software providers that is still around and doing well. By now almost $30 billion worth orders have been placed on stores created with the Volusion platform and in total there have soon been 200 million different orders made through those stores. But how good is Volusion these days? After all often the successful older companies can get bit too complacent and lose their competitive edge. In this review I will take a look at how good Volusion is as we are moving into 2018. I will be especially focusing on comparing Volusion to Shopify as the latter is current the market leader in the e-commerce platform market. At the time of writing this Volusion offer 4 different plans for creating your own online store. The cheapest plan is called "Mini" and costs $15 per month. The second plan is called "Plus" and is priced at $35 per month. The plan that according to Volusion is the most popular one among the store owners is called "Pro" and costs $75/month and finally the most expensive plan is called, appropriately, "Premium". The Premium plan costs $135 per month. When it comes to the features of the plans there are some quite big differences. Maybe the most obvious one is the fact that depending on the plan there is a different number of products you can add to your store and there is also a different bandwidth limit on each plan. With the Mini-plan you can add only 100 products, with the Plus-plan you can add 1,000 products with the "Pro" you can add 10,000 and only with the Premium can you add an unlimited amount of products. I have to say that I'm really not a fan of the fact that the number of products is limited in all of the plans except the Premium one. At Shopify and Squarespace, for example, you can add an unlimited amount of products on each plan. There is also no bandwidth limit at Shopify or Squarespace. It is good to note, that the bandwidth limit can be especially discouraging to potential store owners considering Volusion, as it is often difficult to know how much bandwidth your store might use. When it comes to the actual features of the the different plans, I feel like especially the mini plan also lacks some key features that I would consider to be important for any online store at this days and age. It, for example, doesn't allow the store owner to have ratings and reviews in the store for the products nor does it have the option for newsletters. Volusion does deserve some credit for their rather cheap pricing. Shopify has 3 different plans (excluding their Facebook and custom plan) and their monthly prices are $29, $79 and $299 - so in other words it could be said that Volusion is cheaper for starter stores, medium sized stores and big stores. 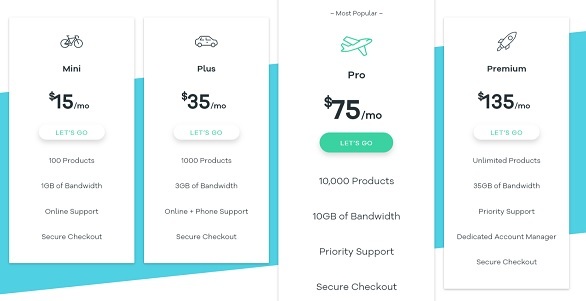 Although, as I probably wouldn't use the Volusion's $15/month plan even if I was just launching a completely new store, that plan could probably in a way be excluded from the comparisons. Something that Volusion needs to be given a big minus for when compared to Shopify, is the fact that their plans don't include a SSL certificate. SSL certificates can be considered to be quite important for an online store's security, and if a visitor sees that a business is not using it, they might not be willing to pay at the online store. In practical terms, the existence of SSL certificate can be seen in the fact that there is the letter "s" after the "http" part in a website's address, so instead of http:// it is https:// (more on https at Wikipedia). At Shopify the certificate is included in all of the plans automatically, but at Volusion you need to buy it separately. And the price is quite high, as the "Volusion Pro SSL", for example, costs $89/year. Due to the importance of the certificate, buying it can almost considered to be a mandatory extra cost. 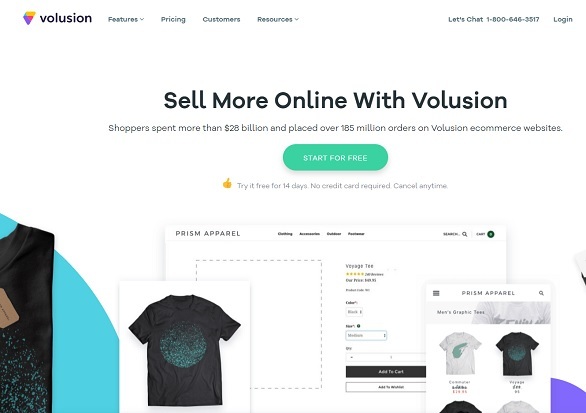 Just like Shopify, Volusion offer its customers a 14 day free trial as well as it offers customers a 10% discount if they order a full year in advance. It is worth noticing however that Shopify also offers a 20% discount if customers order 2 years in advance. At the time of writing this Volusion has a total of 49 themes available for their customers. 11 of the themes are free to use, and for the 38 of them you need to buy the theme in addition to paying for the monthly or annual plan. The one time cost for each of the 38 paid themes is currently $180. The number of free and paid themes at Volusion is roughly similar to the number of paid and free themes at Shopify. With the paid themes the difference between the two companies is that at Shopify the prices start at $140 and go up to $180, instead of being $180 in every case. 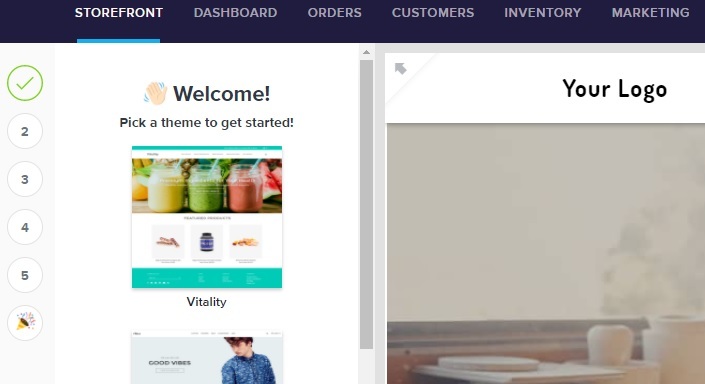 It is also good to note that at Shopify all the paid themes include 2 to 4 different styles of the theme, so in a way you are getting a better deal on the $180 template at Shopify than at Volusion. The free themes at Volusion look quite nice, but in my opinion lack something little bit in that they don't really impress the customer. It could maybe be said that some of the free themes look bit too much like they are from 5 years ago instead of being from 2018. The paid themes look on average bit better, as they obviously should, and are pretty much in line with the themes that Shopify has. All the templates at Volusion are responsive, meaning that they will automatically adapt to the customer's screen size, which is obviously crucial these days. The first stage of the signup at Volusion is quite easy as you are just asked to fill the basic personal details and there is no need to enter your credit card number or anything like that. However, when things can get big confusing is when you are supposed to choose between the two different admin experiences. I haven't seen a system like this before, and in my opinion the user should really be given more information about the different admin experiences. 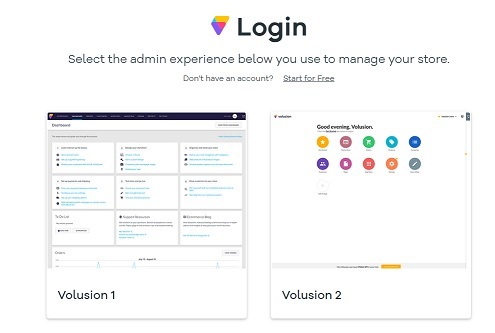 For creating my test site I decided to use admin experience called "Volusion 1", so the further comments in this review should be seen from that point of view. The first thing you need to do when creating your store at Volusion is to pick a template to use. What I really like about this process at Volusion, is the fact that it is very quick and easy to see how the different templates would look like and that naturally makes comparing them very pleasant. After choosing the template to use, the next step is to choose the logo. There are three ways to currently get a logo for your store: you can upload one, you can simply use a text logo or you can create one with an outside service called "Logojoy". For the sake of testing the system I decided to simply go with a text based logo. Following choosing the logo you can now move to adding the first product your store. In this stage you should upload a picture of the product, give it a name, give it a product code and price the product. If you want to, you can also add a description of the product. During this stage you should remember to save the product before moving to the next stage, as the product doesn't get added automatically. In the fourth step it is time to continue customizing your store. Here you can add a banner text, submit a sub text and add a call-to-action. What I really don't like about this stage is the fact you can't really preview the individual modifications, and instead all the changes are only shown after you hit the "save" button. It would make the user-experience more pleasant if you could see the changes right away. For the fifth step you should choose the names of the navigation links for the main menu. This steps works really well and is easy to use. In addition to making it really easy to create your online store, the Volusion back-end also contains some other quite useful features. From the admin panel you can, for example, see sales history data that can help you quickly analyze if your store is moving the right direction. The admin panel also shows you the bandwidth usage, which can be helpful - as mentioned - there are limits on that on each plan at Volusion. Naturally doing things such as adding a whole new product category or adding individual products is also very easy, as is changing the design of the store. Conclusion: should you choose Volusion or Shopify? Volusion is certainly a good e-commerce platform, but is that enough? After all when you are choosing a platform for building your own store, you really only need one product. It is not like choosing in which restaurant to eat, where you might change it up just for the sake of it. With e-commerce platforms you want the one service that will help your online store become as successful as possible and hopefully will do that in a way that doesn't cost too much. 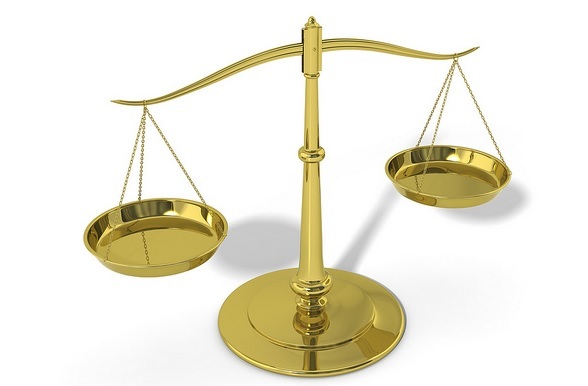 When we look at the individual elements of Volusion compared to Shopify, I would really only rank Volusion better in one aspect of the platforms: the price of the plans. And even that is debatable, as in terms of value for money Shopify is in in my opinion actually better (especially as the plans at Volusion don't include a free SSL certificate). 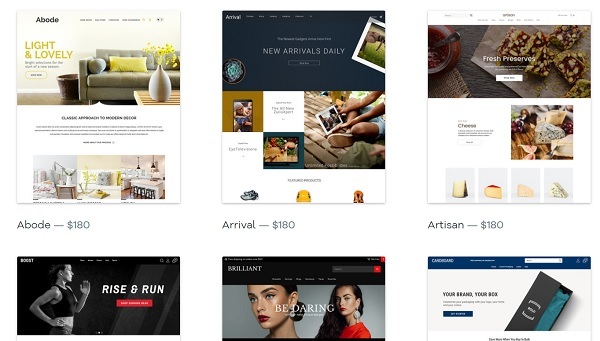 When it comes to the store themes I would rank Shopify better especially on the basis that at its platform the themes include multiple styles for the same one time price. For the usability of the store editor I would rank Shopify slightly better. All in all, I would go with Shopify over Volusion when it comes to building my ecommerce business. 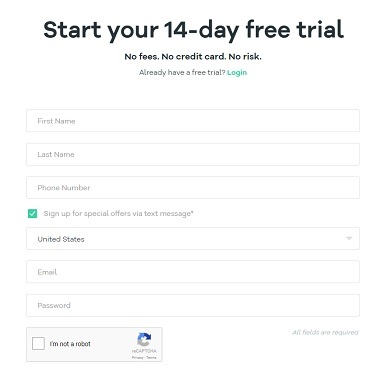 Naturally, as both of the companies offer free trials, nothing stops you from trying both of the platforms and then choosing the one you like more.